Central Clinical School, Monash University comprises about 800 people who study, teach and do medical research, starting at 18 and going up... Curiousity never stops! 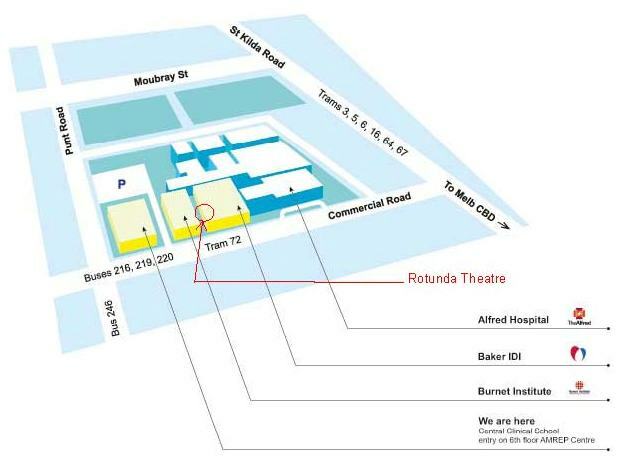 Our school is based at the Alfred Hospital precinct in Melbourne, Victoria and we have a lot to do with the hospital as much of the research has a big clinical component. 25 August De Castella Run for Mental Health - spread the word and joinup! MAPrc runs (so to speak) an annual fundraiser, the De Castella Run for Mental Health. Please share and connect with your professional and private social media networks, whatever your preferred format. Every interaction, large or small creates a run of conversation leading to entries and in turn fundraisers and awareness of the issues in the wider community. 30 October Public Lecture "Beating the bloat: the FODMAP diet andIrritable Bowel Syndrome"
Central Clinical School's annual public lecture for 2013 is on one of the most common complaints in our community, irritable bowel syndrome (IBS), and how diet can be used to control the symptoms. Cashin K, Gray LR, Jakobsen MR, Sterjovski J, Churchill MJ, Gorry PR (2013). CoRSeqV3-C: A novel HIV-1 subtype C specific V3 sequence based coreceptor specificity prediction algorithm. Retrovirology, 2013. Flynn JK, Paukovics G, Ellett A, Moore M, Gray LR, Duncan R, et al. The magnitude of HIV-1 resistance to the CCR5 antagonist maraviroc imparts a differential alteration in HIV-1 tropism for macrophages and T-cell subsets. Virology, 2013. Professor Paul Komesaroff, Centre for Ethics in Medicine and Society, said we need a better approach to dealing with asylum seekers, namely, to stop the problem at source by reconciling the conflict causing the exodus in the first place. For us not to address this is morally and financially exorbitantly expensive. A/Prof Edwina Wright, Department of Infectious Diseases, is Principal Investigator for a Victorian trial to test the effectiveness of medications in preventing the spread of HIV, e.g. from an HIV infected partner to a HIV negative partner. The trial has been awarded $320,000 by the Victorian Department of Health and Gilead will be supplying antiretroviral therapy for 100 people for 1 year. The study duration is 3 years. ECR events provide an AMREP-wide forum for ECRs to present and discuss their work in both oral and poster presentations. These showcase events are intended to foster collaborations, networking and a greater awareness of the expertise and research being conducted on the site.